Before you take to the roads (or skies) this holiday season, make sure you are ready for both the expected and unexpected. These simple tips can help make the difference. 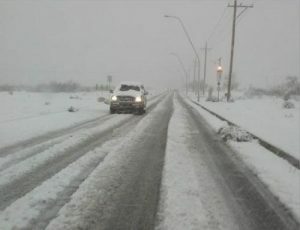 Stick to main roads/highways when possible: If there is adverse weather expected, stick to the main roads. You can go sightseeing later when the weather is better. Highway crews prioritize the clearing of busy roads during storms, and usually have no capability of ever clearing small roads. Let others know your plans: Make sure friends/family are aware of your travel plans, to include the route(s) you plan to take, and when to expect you. Importantly, stick to the planned route(s), or let them know if you have to change plans. Bring extra blankets, clothes, and supplies: You may be perfectly fine driving in bad weather, but other people on the road might not be as skilled. If they cause you to crash, make sure you are able to get by until emergency help arrives. An extra coat, blanket, some food and water can all be very helpful. Make sure your cellphone is charged, and bring along a car charger. It is difficult to communicate with others, including calling for help, if you don’t have a way to do it. If you plan on listening to music from your phone, keep it plugged in so your battery is still in good shape so you can call if you need to. Slow down in bad weather: If you encounter bad weather, like rain, sleet or snow, slow down. Wet pavement reduces traction, which makes braking difficult. If you have to stop, try to plan where you will pull off the road. Look for level, paved shoulders, rest areas, parking lots, etc. If you are still near the road, stay in your vehicle, keep your seatbelt on, and turn on your hazard lights. Keep fuel in your tank: Winter is not the time to try to see how far you can go before you run out of fuel. When you get below half a tank and have an opportunity to refuel, take it. Remember, a winter storm may mean power is out in the place you otherwise might have been planning to get fuel, and you could be stuck. If stranded, stay warm and ration supplies: If you get stranded in a storm in winter, stay inside the vehicle if possible to avoid being exposed to frigid temperatures. Ration food, water, and fuel, and get out that blanket you brought to help stay warm. If needed, run the vehicle for about 10 minutes each hour to generate heat, but make sure the tailpipe/exhaust pipe is not blocked, and crack a window so you don’t get carbon monoxide in the car.